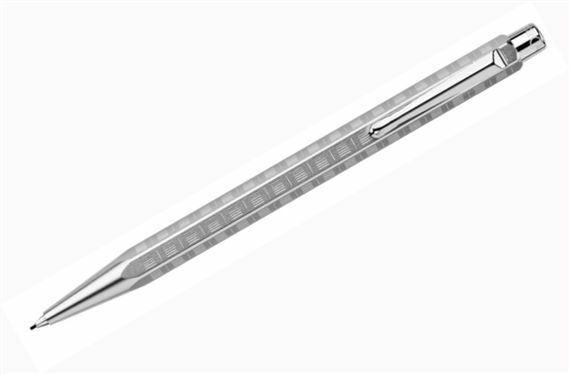 Order your Caran d'Ache Ecridor Variation 0.7mm Pencil today from FahrneysPens.com. Fine Pens, Refills & Luxurious Gifts – great prices & fast shipping. The new Caran d'Ache Ecridor Variation is an innovative design inspired by rhythmic variations of musical phrases. Caran d’Ache craftsmen precision engrave the iconic hexagonal profile with a symmetrical lined pattern similar to a coded sound rhythm. The palladium finish is glass blasted to highlight the dynamic guilloche motif. You’ll love the Swissmade quality of the Variation fountain pen with steel nib, capped rollerball, and ball pen or 0.7mm pencil with push-top mechanism.